CARY, N.C. - Scott McGough (Oregon) struck out nine batters in five innings of work and Ryan Wright (Louisville) collected a team-best three hits as the Collegiate National Team took game two of the five-game international friendly series against Korea, 8-1 Thursday night. McGough and Team USA’s pitching staff held Korea to just two hits while striking out 13 total batters. Brian Johnson (Florida) got the start working two innings allowing one run with two strike outs before McGough relieved him in the third frame. Nick Ramirez (Cal State Fullerton) picked up the two-inning save with two strikeouts. Team USA used a three-run sixth inning to take a 3-1 lead thanks to RBI singles by Nolan Fontana (Florida), Wright and Nick Ramirez. 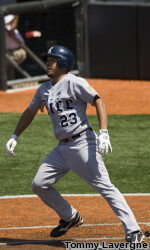 Mikie Mahtook (LSU) reached when he was plunked by a pitch then took second on a sac bunt from Drew Maggi (Arizona State). Fontana lifted a bloop single just behind bag at third pushing across Mahtook for Team USA’s first run of the contest. Jackie Bradley, Jr. drew a walk and Wright singled to left center scoring Fontana from second for the game-winning run. Nick Ramirez followed with a shot through the right side sending Bradley, Jr. home to cap the scoring. After a two-hour rain delay, Korea struck first in the bottom of the first inning on a one-out double from Min Sik Kim that scored Hun Gon Kim from second. Hun Kim walked to lead off the inning then moved to second on a Bon Ki Shin sac bunt before Min Sik Kim stroked a two-base hit to left center. Team USA scored five runs over the final two frames to claim its second win of the series and third of the season. Offensively the Collegiate National Team registered nine base hits with Wright and Nick Ramirez each posting multi-hit games. The two teams will travel to Fort Mill, S.C. for the third game ff the five-game series Friday night with a 7:15 p.m. (EST) first pitch scheduled at the Knights Stadium. Notes: Team USA will take batting practice from 4:30 to 5:15 p.m. at the Knights Stadium on Friday. Rendon Out: USA Baseball Collegiate National Team third baseman Anthony Rendon (Rice) suffered a fracture-dislocation of his right ankle in Wednesday night’s 3-0 win over Korea at the National Training Complex in Cary, N.C. Baseball America‘s Player of the Year will miss the remainder of Team USA’s 2010 summer season. The injury occurred in the first inning as Rendon was picked off of first and attempted to avoid a tag in a rundown between first and second base. He was immediately treated on-field by USA Baseball team doctors and was taken to the hospital for X-rays and further treatment. Rendon is scheduled to return to Houston on Friday for evaluation and surgery. A replacement player will be named to the team in the coming days.